This virtual museum deals with the history of the development of the manual typewriter. Only the earliest of electric typewriters are mentioned. But obviously, the story of the typewriter does not end in 1920. After World War II, the electric typewriter advanced in the office world, with the IBM 'golf ball' system as market leader (note that this system was basically invented by Blickensderfer in the 19th Century, and was perfected in the 1902 Blickensderfer Electric). Later still the electronic typewriter, the video writer and the word processor entered the market, pushing many producers of mechanical typewriters off the market. In the early 70s Varityper, the direct descendant of the 1881 Hammond, stopped production. The Remington name disappeared in the same decade. But even today, manual typewriters are produced and sold in small numbers to happy users around the world. History has not ended yet. 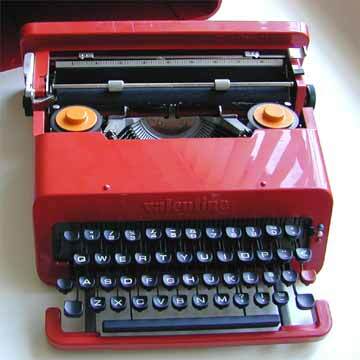 If there is one post-1920s typewriter that deserves a place in this museum, it is the Olivetti Valentine, a design by Ettore Sottsass. This space-age machine, that was built in 1970, can be found in many collections of industrial design. Mechanically, the machine is not fundamentally different from the average machine that was built half a century earlier. Today, Olivetti is the only Western company still producing manual typewriters.